Are you interested in booking a field trip? Read "Tips for your visit"
We strive to connect visitors with our remarkable collection of artifacts, manuscripts, and artwork. Visiting groups are encouraged to call ahead to arrange for a guided tour with a museum educator or choose a self-guided tour and view the museum at their own pace. 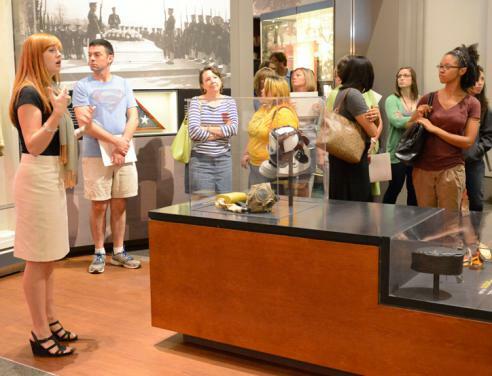 Your time at the Virginia Museum of History & Culture can be enhanced by booking a guided tour, whether you’re in town for a family reunion, looking for an activity for your church group, or interested in a corporate outing for your employees. We request that groups of ten or more reserve a time for a guided tour before your visit. Reservations for a guided tour must be booked at least two weeks in advance, and large groups may require additional notice. Your group can choose to explore the The Story of Virginia or one of our other long-term exhibitions. Fill out the group reservation form. Please view our tips for your visit before bringing your group to the museum. Groups of fewer than ten people do not need to make a reservation to view the galleries on their own. We do not offer guided tours without a reservation. The Virginia Museum of History & Culture offers Girl Scout programs for of all ages. If you would like more information, please contact Maggie Creech, Group Tour Coordinator, at mcreech@VirginiaHistory.org or at 804.342.9652. Hi! Are you interested in booking a tour for your group or want to learn about our customized group programs? I can help you plan your visit the Virginia Museum of History & Culture. I may be reached at mcreech@VirginiaHistory.org or at 804.342.9652.